This time of year I find I have a lot of squash on hand. There are so many because I have used them for decoration inside and outside my home. I have a mound of pumpkins outside my front door. And there is the bowl full of gourds and squash on my dining table. They look so festive and last a long time. Most make it from Halloween through Thanksgiving. Then comes the time to move onto Christmas. It is time for the fall decorations to go. It doesn't seem right to just throw them away. Instead I find ways to make meals out of them. When the weather is cool there is nothing better than a hearty chili. A chili made with squash can be amazingly dense and filling without adding any meat. And after a big Thanksgiving meal with turkey, sausage stuffing and gravy with giblets it is nice to have a break from meat. 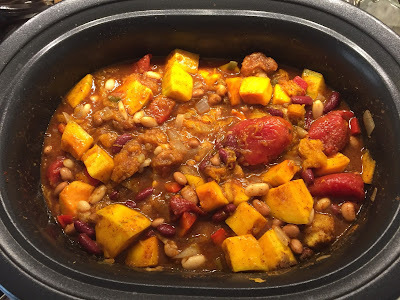 A recent invention of mine is a three squash and three bean chili. It was a big hit and made for multiple meals, a nice thing after all the cooking for Thanksgiving. Cut acorn and pumpkin squashes in half and de-seed them. Place them on a cookie sheet sprayed with cooking spray, halved side down. Bake at 350 degrees for 20 minutes. Let them cool for 5-10 minutes and then scrape out the insides, cutting into large pieces, they may be slightly mushy chunks. While the first two squashes are baking, peel, cut and de-seed the butternut squash, cutting it into medium chunks. Alternately, it is easy to buy Butternut squash already cut up in the grocery section of your local grocery store to save some prep time. Add all squashes and onion mixture into the slow cooker along with all other ingredients. Top with a tablespoon of Greek yogurt and a teaspoon of chopped green onion, if desired. 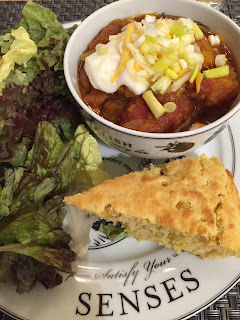 To make it a meal--pair the chili with a muffin. Enjoy! Live Vibrant! And Eat Mindfully.